Attic24: Wreath Love ♥ Thank you! Awwwwwwwwwwwwww, you lot, how very good you make me feel!!! Thank you, thank you, thank you so very much for all the Wreath Love, it has been wonderful reading your generous comments. Truly wonderful. It has really made me very happy to absorb your words. Thank you. We had a storm pass through here last night with heavy rain and strong winds. This morning, I noticed that so many of the tress in my neighbourhood have been blown bare overnight, leaving almost no Autumn leaves on the branches now. How fleeting the glory has been, but it has made me even more grateful for the photos and memories I've managed to record here on my blog. My wreath has somehow captured and presereved the past month of colourful, leafy Autumn and I love it for that. After the rain clouds blew out of town this morning, we were treated to another spell of glorious sunshine. My living room looked so bright and pretty when I walked in this morning, that I couldn't resist another little photo shoot. Also, I thought of a few more things that I forgot to talk about in the excitement of yesterday. So, the stripes. Many of you commented on how odd it is that I bothered to make the wreath base beautifully stripy, only to then go and cover it all up with Stuff. Fair point. There are two reasons for this. Firstly, if I'm going to work up 80 odd rows of crochet, I need a sure fire way to prevent boredom setting in. Honestly, the thought of sitting down with just one colour to crochet a long length makes me want to jack it all in before I begin. So stripes it is, and then the pleasure is there right from the start. Secondly :: the stripes don't show when you look at the wreath head on (ie in most of the photographs I've been showing you), but when it is hung on the wall I am often looking at it from an angle. As I don't decorate the sides of the half wreath, only the front, it's important that the sides still look pretty as you do see them. The above photos demonstrate this nicely. The other thing I forgot to mention was the yarn I used for the decorations. As I've had lots of asks about this here on my blog and over on my Facebook page, I thought I should tell you a bit about it. For all my wreaths I've used various Merino yarns, which I love a lot. The colours are vibrant and varied, it feels beautifully soft and smooth, it creates an appealing, even texture when worked up and it is a little bit more forgiving than cotton yarn. In my basket above, I've got all the shades I used in my Autumn Wreath. There's a mixture of Rico Essentials Merino DK, Drops Extra Fine Merino DK and Drops Baby Merino 4ply. There are also one or two oddments of Debbie Bliss Baby Cashmerino in there too. The browns (all Drops merino) were a new thing for me, and they were OK in moderation. Lets just say that I coped with them for necessary acorn and hedgehog production, but I don't expect I'll be making a habit of it. The other colours were much more "me" and filled me with delight. I did miss my favourite cool shades of aqua and blue, but these rich, hot colours are pretty knock-out. I can highly recommend building a stash of merino yarns, if your pennies can stretch to it. They aren't dirt cheap or bargainous, but they do have super yardage and consequently seem to last for aaaaaaages. They deliver such a lot of hooky pleasure and are equally good for making snuggly projects (blankets, wraps, scarves, mitts) and small decorative projects. I am feeling ever so slightly bereft now that my Autumn Wreath is complete, it's always a weeny bit sad when a happy, productive, satisfying project comes to a close. It's just as well I have a trillion new ideas flooding in behind it, jostling for my attention, waiting to be chosen. Another gratuitous Wreath Shot, sorry, I just couldn't resist. Awww Hollie.....you are my dream critter! I LOVE all of the beautiful color in your designs! It is so cheerful and literally makes me smile everytime I peruse your pages... Thank you! Third post today, my initial post thanking you for the flower decoration pattern and photos, the competition and now again when I saw your beautiful wreaths. They're absolutely gorgeous but can I be cheeky and also say how lovely your crochet lampshade is in the corner of your room in the penultimate photograph. Your room looks beautiful, the height of comfort and warmth. I can just feel the lovely wooliness of your creations. It must give you great pleasure to know that you created such a beautiful room. Blimey, I'm waxing lyrical today - sorry. Just was blown away but the beauty of your talent (but in a non-creepy way). Right, where did I put my wool basket and my hooks - inspired, you bet!!!! Your autumn wreath is just beautiful... so inspiring. Lucy-love, the crafting world just adores your creativity and yes, we who know you can spot your wonderful work in amongst the other Pins and Reposts. Your style stands alone with distinction. You rock, lady of the Attic, may your next project be as much fur for ALL of US as the wreaths have been. Do I sense perhaps a Winter Wreath with a bit of white maybe ?~! My love to J and the LPs. It's adorable! I half expect some little woodland piskie to come poking their head around the toadstools. :) Have you toyed with the idea of displaying all four at once, like a Four Seasons montage? Dear God woman you have done it again! Gorgeous! Waiting to be chosen...that sums it up perfectly for me as well, all the time! lol I just spotted a lovely crochet cuppa from Coco Rose that has the wheels turning...now, if I can work it in between Christmas presents. ;)It would look perfect with the holiday tarts I just finished. Have a great rest of the week! Look forward to your next crochet adventure. You wreath is absolutely stunningly beautiful. Coming over to your blog and looking at your latest creations is always a joy. 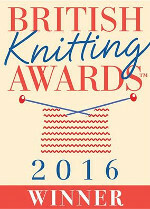 I think you should be nominated in the new year honours for services to crochet (and to all of us)! Que linda que ficou Lucy parabéns,amo os teus trabalhos se morasse ai ira encomendar para eu.Beijos aqui do Brasil. In one word: gorgeous! Well done. I can't say it enough your wreath is so beautiful!